Daring Bakers: Maple Mousse In An Edible Container ~ I Can Do That! The edible containers theme continues with this month's Daring Bakers. Thanks Evelyne for allowing us to choose our containers for the light, airy, and delicious maple mousse. Bring maple syrup to a boil then remove from heat. In a large bowl, whisk egg yolks and pour a little bit of the maple syrup while whisking to temper the yolks. Add warmed egg yolks to hot maple syrup until well mixed. Measure ¼ cup of whipping cream in a bowl and sprinkle the gelatin. Let it rest for 5 minutes. Place the bowl on top of a pan of barely simmering water, stir to ensure the gelatin has completely dissolved. Whisk the gelatin mixture into the maple syrup mixture and set aside. Whisk occasionally for approximately an hour or until the mixture has the consistency of an unbeaten raw egg white. Whip the remaining cream. Stir ¼ of the whipped cream into the maple syrup mixture. Fold in the remaining cream and refrigerate for at least an hour. Remove from the fridge and divide equally among your edible containers. One of Evelyne's suggestions for containers is crispy bacon cups. I made them sweet and extra crunchy by dipping them in raw sugar before baking. I have candied bacon before and loved them as a snack but never tried it with ice cream or mousse. The crunchy bacon combined with maple mousse and chocolate meringue is heavenly. Snip bacon strips on both sides and dip in sugar. Form into coils and place in muffin cups. Bake in a 400°F oven until edges and bottom are dark brown. Leave for a minute in cups to cool and set slightly. Transfer on a plate with paper towel to remove excess grease. Let cool completely on a wire rack before filling with mousse. I had a few lemon rind confit in the refrigerator and thought the tangy, slightly bitter, and sweet rinds would be perfect containers for the mousse. I added a pinch of ground ginger to half of the meringue recipe and the ginger flavor is just about right, not too weak nor strong. I love this combination too. Heat sugar, glucose, and water until sugar dissolves. Let cool. Juice lemons, keep juice for another use. Scrape and clean the insides of the lemon rinds leaving the white pith on. Boil water and add rinds; boil for half a minute then drain. Boil and drain 4 more times with fresh water each time. Bring the syrup to a boil in a pot. Add the blanched rinds and let simmer for 1 hour, making sure the syrup does not boil and completely covers the rinds. Turn heat off and let rinds cool in the syrup. Transfer to a container, cover tightly and refrigerate until needed. Trim the bottom if using as a container for mousse or ice cream. 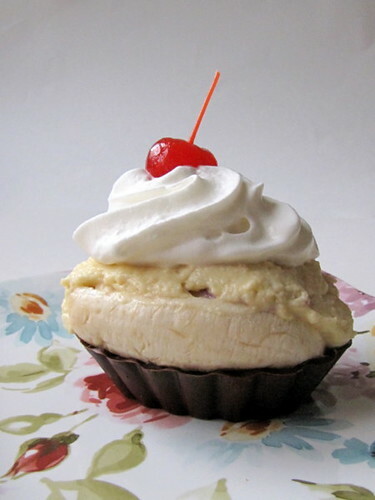 All three of your edible containers look wonderful, but I think the maple banana split was just inspired!! Really great work on the challenge! wow...amazing especially the candied bacon. Very creative creations! Love your lemon rind bowl. The tartness would have been a perfect contrast to the sweet maple mousse. 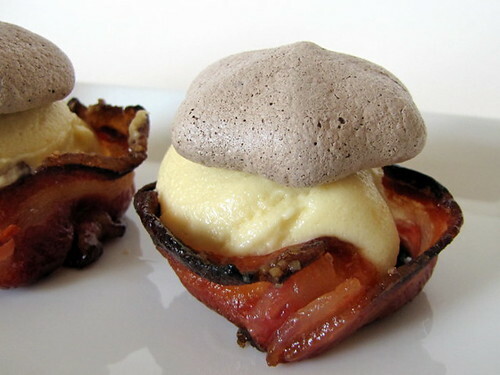 Okay, I like all three but my favorite is the one with candied bacon. Remember what they always say and it's true - - Anything with bacon is GOOD! LOL. Nice yummy pix Oggi. Love all your inspiration and my favorite is the lemon rind container, very clever! I love love love the lemon one. Good job! I don't believe you did three of them. All your containers are beautiful, but I really love the lemon one - I think the combination with the maple mousse would have been perfect. 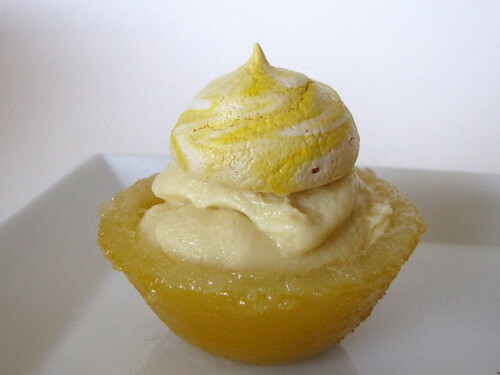 The yellow streaked meringue looks so pretty too! That banana split has to be the star of your maple mousse show. Looks beautiful. Oggi, congratulations, you are one of the 5 finalists for the most creative edible container for the DBs! YAY!!! I hope you don't mind me showing off your photo (linked back to your blog, of course) on my blog. Love the banana split style. It's beautiful and ùi would take a bite of it! Bravo! Absolutely beautiful and creative containers, Oggi! They are all amazing, and I can see why the lemopn rind confit cup is one of the finalists! Amazing! even your bacon cup really looks like candy. Love the banana split too! Phenomenal job as always!